The Space Needle. It’s the symbol of Seattle, one of the most recognizable landmarks in the world, and it’s right here for all of us to enjoy. No matter where you’re taking in the view of Seattle, your eyes always go directly to the Space Needle. You can’t help it — it’s like a magnet. Not only can you admire the icon from the ground, you can also take in the incredible view from the top of the Space Needle. Built in 1962 for the World’s Fair in Seattle, the Space Needle was once the tallest structure in the Emerald City. From the SpaceBase store at the bottom to the flashing red beacon on top, the Space Needle stands 605-feet tall, making it the highest observation tower in the Northwest and the fourth tallest in the country. There are a few different levels of the Space Needle. The first is the Skyline level (the boxy looking area near the bottom), which is the Space Needle’s private event and banquet space (100-feet above the ground). The second level is the revolving SkyCity restaurant at 500-feet, and the third level is the observation deck at 520-feet. TIP: It takes the elevator 40 seconds to get to the Space Needle observation deck. There are windows in the elevator, so be sure to position yourself by one of those. That way you can enjoy the views on your ride up. Tove and I have heard several people complain when they’re stuck in the back elevator without a view (even though they’ll still have the breathtaking view from the top of the Space Needle when they reach the top). 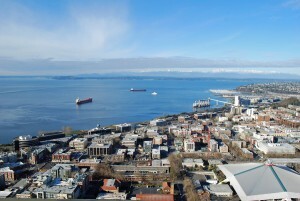 The Space Needle observation deck offers indoor and outdoor, 360 degree panoramic views of Seattle. 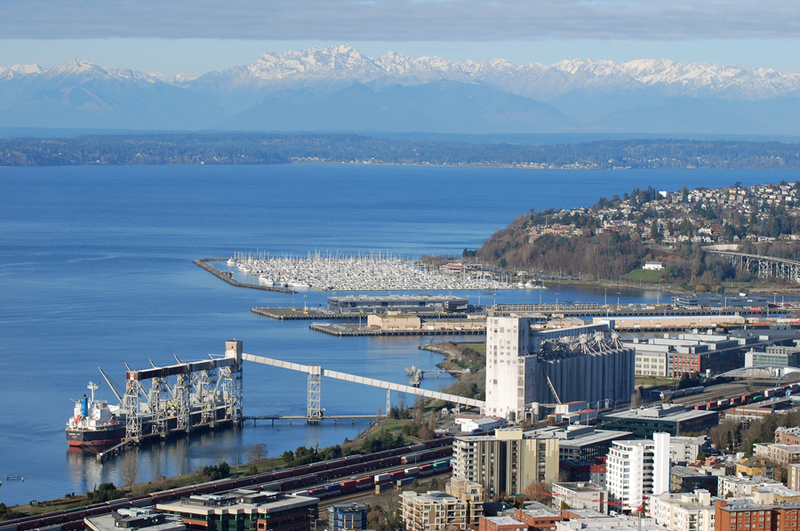 To the south you stare directly at downtown Seattle and Mount Rainier, to the west you can admire the Puget Sound and the Olympic Mountains, to the north you’ll find Mount Baker and Lake Union, and to the east you see Bellevue and the Cascade Mountains. If you don’t know the area well, there are plenty of informational kiosks inside the observation deck that help you figure out what you’re looking at. 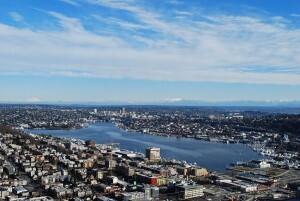 You can enjoy the view from the top of the Space Needle 365 days a year. It’s open day and night (click here to see what the view is like at night), with varying hours of operation throughout the year. Be sure to check the hours before you visit the Space Needle, and note that ticket sales end 30-minutes before closing time. General admission to the Space Needle observation deck is $18 for adults (13-64), $16 for seniors (65+), and $11 for kids (4-12). If you’re not sure what day you want to visit, you can purchase a flex pass for a few extra bucks per person. You can also buy a day/night pass, which allows you to take in the view from the top of the Space Needle twice in a 24 hour period. 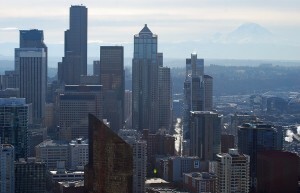 NOTE: The Seattle CityPASS is the best deal you can find in the city. It gives you day/night admission to the Space Needle, plus access to four other popular tourist attractions (including the Museum of Pop Culture, the Seattle Aquarium, and Woodland Park Zoo). A single Seattle CityPASS ticket booklet saves you up to 50% on admission to all five attractions. 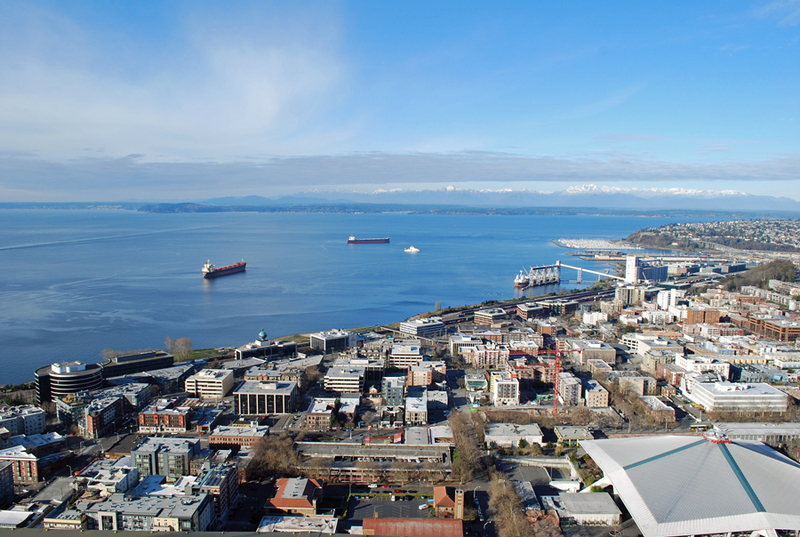 If you’re visiting Seattle, you have to take in the view from the top of the Space Needle. I mean…c’mon…it’s the SPACE NEEDLE! If you live in Seattle, you shouldn’t take the Space Needle for granted. Growing up here, I’ve seen the view from the top of the Space Needle too many times to count, but it never ever gets old. 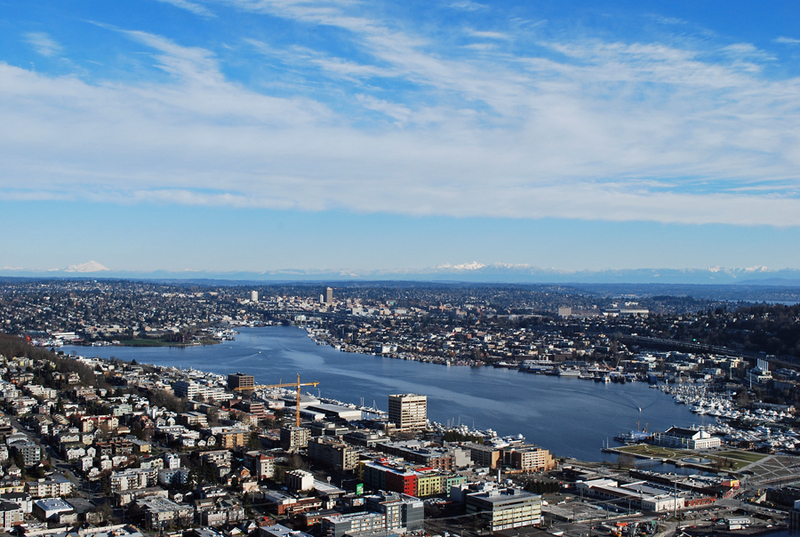 Depending on the weather, time of day, and the company you’re with, it’s a different experience every time you step on the Space Needle observation deck. Don’t miss out on the fun! 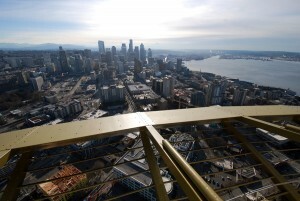 Have you ever taken in the view from the top of the Space Needle? How was your experience? We’d love to hear all about it! Please leave a comment below or connect with us on Twitter, Facebook, and Google+. Don’t forget to also check out Seattle Bloggers for more great places to experience in the Emerald City! SOOO glad I found your blog! My husband and I will be visiting Seattle for the first time later this year, and we’ll be sure to get the day/night pass for the Space Needle. Thanks for the tip!!! 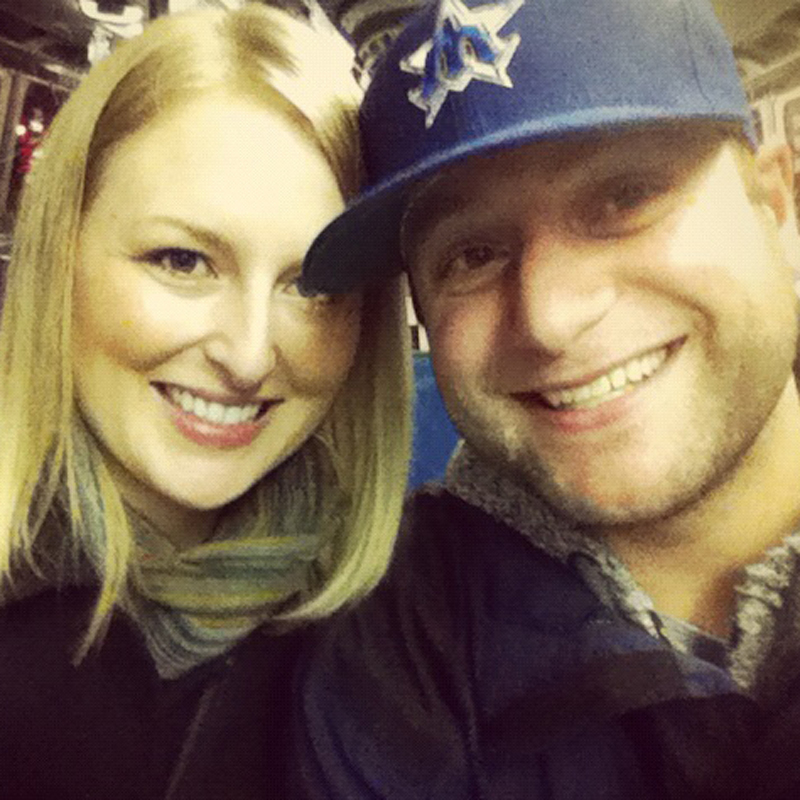 I’ll be visiting Seattle with my husband for the first time! We are so excited! I’m so glad I happened upon your blog! It’s even better than Trip Advisor! Thanks for the nice compliment! Enjoy your trip!! !